Most all VTRs have pinch rollers. These little tires pinch the tape against the capstan and pulls it through the machine. They get hard and lose their grip over time and can cause tape damage by changing the geometry of the tape path. You can sometimes clean and renew the rubber but the attempted repair doesn’t last long. The only real solution is to replace the roller. 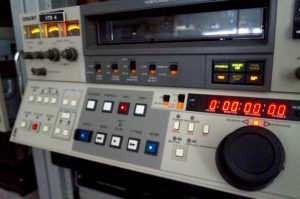 Average cost for a small cassette VTR is around $75, Some 2″ audio decks may run up to $250. Just a small example on how expensive it is to properly take care of old machines. Our VPR-3s don’t use a pinch roller but a vacuum capstan. This provides better grip. The capstan actually drives the tape through the machine and the reel motors take up the slack.